You may wonder what on earth a mom would want to do with a 3-D printer–if you’re asking that question, I’d kindly direct you to the URL above. 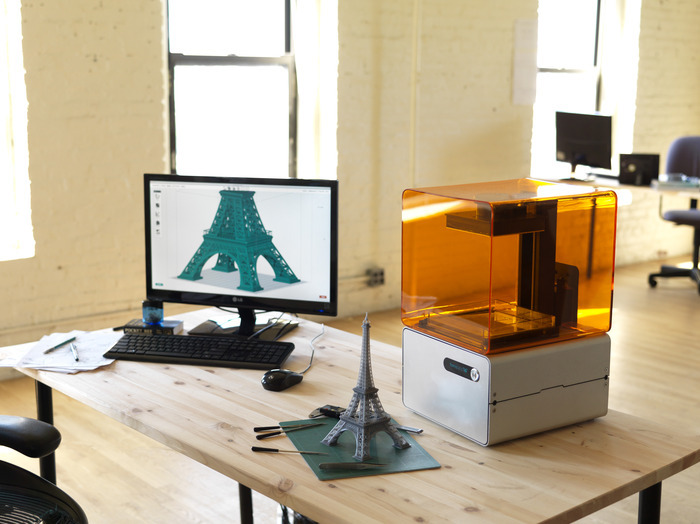 As 3-D printers are catapulting toward affordability, you’re going to start seeing a great many more applications. I have a feeling that in the future, our kids will all have 3-D printers at their fingertips. But right now, for the first time, I feel like getting one of these amazing gadgets is actually possible. So to get your imaginations going along with me, here’s five things I’d do right away if I owned a Form 1 3-D printer (once I master the software, etc., –but those are just details). Cookie Cutters — Like many bakers out there, I’m miffed by the price and the lack of creativity when it comes to cookie cutters. My kid wants Volkswagen Beetles and band logos and superhero emblems. He’s not interested in the ugly looking lumpy cars or holiday variations you see at general big box craft stores. With a little computer knowhow it’d be easy as pie to get the right silhouette, much to the delight of my boy. Personally I’d love font cookie cutters for use on little cookies and in fondant and other cake decorations. The geek in me rejoices in a well-shaped confectionary script! Fractal Ornaments — Holiday ornaments are one of my favorite gifts, but crocheting a dozen little snowflakes is both time-consuming and, let’s be honest, a little old-fashioned (even if they are totally pretty). These days, since my hands are unfortunately at the mercy of RSI and other fun ailments, the reality of being able to craft all that in time for the holidays is pretty impossible. But creating some awesome fractal art and then printing it out? Geeky and festive. Custom Charms — The first time I heard about 3-D printing was through my awesome coworker, Stacey, who is a big fan of Shapeways. Then I saw the booth at Maker Faire two years ago, and was totally blown away with the quality and creativity expressed in jewelry. While I dig the rings and everything, I’d absolutely love to work on some custom charms. Charlie the Unicorn? A replica of the Dark Crystal? A Triforce? Sure, I could always sell them. Or I could wear all the awesome at once! Custom Dice — This is where I start getting giddy. I am a bit superstitious when it comes to dice. I typically have a different set for each character–or at least, up until my last character I did, as I felt as if I was hitting critical mass with the amount of dice I’d gathered over the last few years. But being able to design and print custom dice for characters with different fonts and textures would rock. There are already some great examples out there, but I say they need not be super complex. Sometimes a little subtlety is all you need. D&D/Game Miniatures — Having spent hours and hours standing in front of the die-cast figurines at our local game store, I can attest to the fact that finding the perfect match to the vision of your character in your head can be a real challenge. I’m picky. If my paladin is a half-elf, by Melora, she’s going to looking like a half-elf. And she’ll be carrying the correct weapon, and if possible, be wearing the correct kind of armor. Finding that level of precision is pretty much impossible unless you have the capabilities of a 3-D printer. So, yeah. I can easily see myself spending the majority of my time making D&D miniatures and game pieces. And setting up little dioramas. And perfect lighting. And… I’m going to stop right there. Of course, this list is nowhere near exhaustive. There are gajillions of possibilities and infinite applications. That’s the beauty of 3-D printing–with a little skill and practice, you can print the world. I haven’t even really delved into what I’d do for my kids, which would likely be hundreds of entries long considering all the ways you could print toys (from replacement parts to mods to their own creations) and crafts. Be sure to check out the Kickstarter if you haven’t already. And since we’re dreaming, tell us what you’d print right away!